A trio of Freedom athletes braved a bitterly cold Sunday morning to race at the fourth running of the Bass Belle 10 miler at Bassingbourn. Why the name Belle? Firstly, Bassingbourn is linked with the famous WWII flying fortress the Memphis Belle. Secondly, the course itself is beautiful or in French - 'Belle'. It is a fast, flat course which consists of 8.5 miles on road and 1.5miles off road along a grass track. James Thomas ran a stormer, finishing in 01:09:17, 11th in age group. Amanda Maylin finished in 01:31:35, 20th in age group, with Gareth Sharp finished with Amanda in his sights in 01:32:32, 58th in age group. 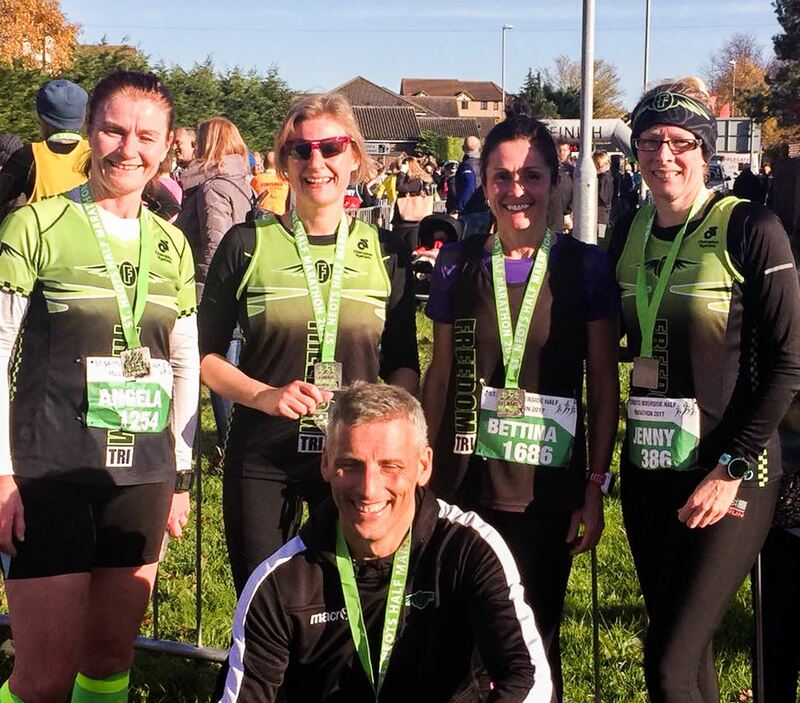 The ever popular St.Neots Half Marathon was held over the weekend with yet another impressive showing from the Freedom ladies. Jenny Cotter continued her great form by posting 1:40:46 (5th AG) with Rachel Carling hot on her heels in 1:42:30 (23th AG); Bettina West 1:44:56 (12th AG) and Angela Phillips 1:45:46 (15th AG). Matthew Sayers was first Freedom male in 1:19:16 (7th AG) with Mickey Day 1:29:20 (46th AG) and Lee Gilchrist 1:36:31. Over at Knebworth House they were launching the inaugural Hertfordshire Half starting off in the grounds of the iconic house and then onto closed roads. Again some great times to be had with Emma Kinsey running the 13.1 mile race in 1:55:19 (54th AG); Ryan Nicholl 1:28:58 (8th AG); Luke Nicholl 1:29:10 (30th AG); Richard Springall 1:29:11 (29th AG) and Paul Sowter 1:37:08 (73rd AG). Ann Tryssesoone ran the Brighton 10k along the seafront of Brighton & Hove starting off in Madeira Drive. Ann was delighted to complete the race in 49:36. Angela Phillips, Rachel Carling, Bettina West, Jenny Cotter & Mickey Day at St.Neots Half Marathon. The Tour de Force that is Freedom Tri once again wore their running singlets with pride for yet another cross country lung busting mud fest. This time Trent Park in Cockfosters, north London played host. This 320 hectare site dates back to the 14th Century, and once was a favoured hunting ground of Henry IV and has many Grade II listed statues & buildings to admire. After race 2 Freedom Tri are positioned 12th in the combined rankings, with the women's team still holding on to their 7th placed spot just below FVS - with the women's Masters team an incredible 5th! The men's team are placed 14th in the standings. Special mention once again goes to Rachel Carling's impressive time of 36:46 with James Parsons leading the men home in 31:29. Freedom Cross Country team at Trent Park. 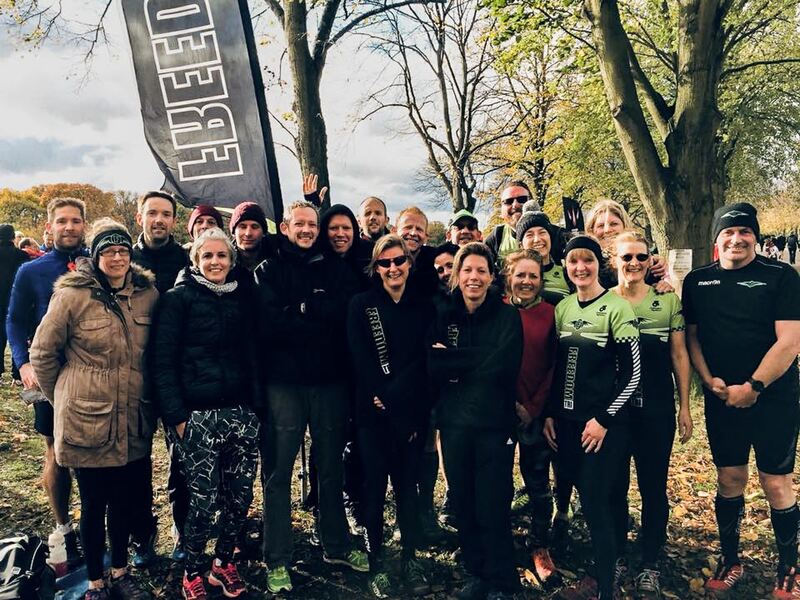 There was a fantastic turnout at the first of this season's 5 mile cross country races held at Cheshunt, with over 20 Freedom athletes blowing the cobwebs off their all-terrain knobblies. 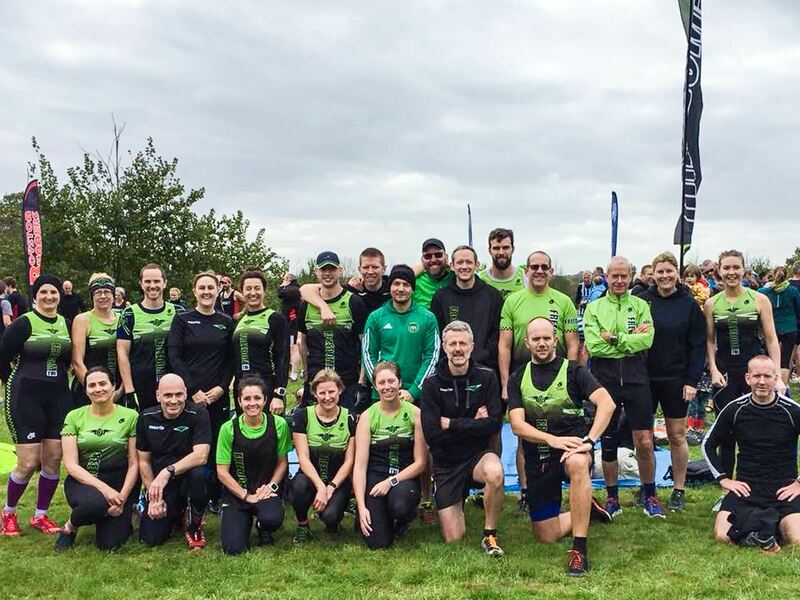 This winter league is organised by Run Herts with cumulative points scored over the coming months and is always hotly contested amongst local running and tri clubs. Results after race 1: Freedom mens/ladies combined are currently 12th out of 20 teams scoring 1452 points - the lower the better! Broken down the women's team again showing their strength led by Rachel Carling (in 37:29), currently 7th out of 20. The men's team 12th out of 20 led by James Parsons (32:12). Over at Shuttleworth College it was all about Cyclo-Cross with race 7 in the Central League organised by British Cycling with Icknield RC. Competing in the novice race managing 3 laps of a tough, grassy technical course including two jumps; Declan McCabe came 15th in 35:26 with Adrian Robinson 20th in 40:10. In it's 38th year, the Dublin Marathon is now the largest in Ireland and the fifth largest in Europe. Emma Croxon joined 20,000 other runners to complete the race in an excellent time of 5:59:37. Meanwhile over in Oxfordshire at the Abingdon Marathon, James Parsons came an impressive 74th in 2:58:33 with Suzy Hawkins concluding an epic season with 275th place in 3:22:33. Sunday also saw the 34th running of the Stevenage Half Marathon organised by FVS, with all proceeds going to charity. The course was windy and undulating following the town's tarmacked cyclepaths. First home for Freedom was Steffan lestyn Ford 11th in 1:24:16 closely followed by Ryan Nicoll 17th in 1:25:32 with James Thomas 66th in 1:35:55 and Gareth Sharp 351st in 2:12:19. 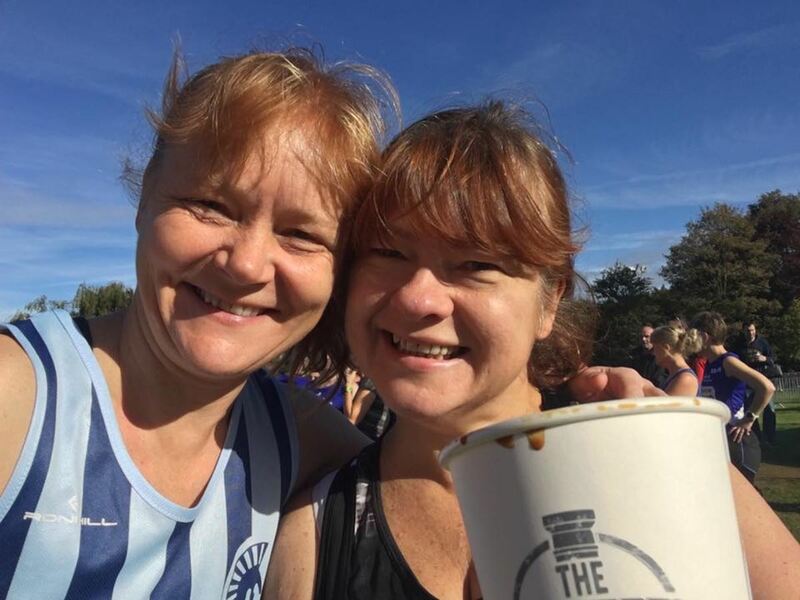 Venturing down to the coast, Liz Aitken took on the 10 mile Great South Run. This fast and flat course is steeped in history and takes you on a tour of Old Portsmouth taking in HMS Victory and the Mary Rose museum. Liz was delighted to complete the race in 1:46:28. 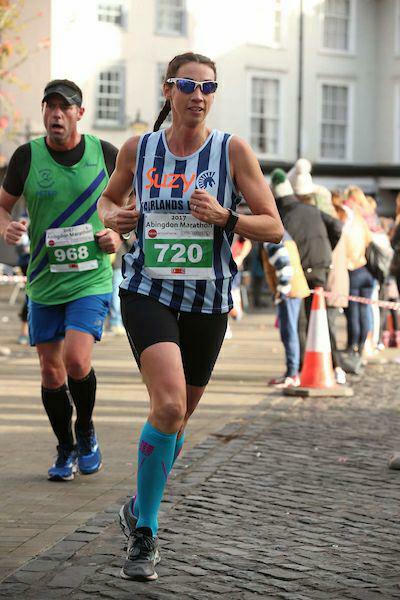 Suzy Hawkins at the Abingdon Marathon. Sunday saw the autumn installment of Nice Tri's Autodome Duathlon. This unique race includes the excitement of a mass start, and the thrill of racing around the smooth, fast tarmac of Bedford Autodrome motor racing track, with plenty of vantage points where friends and family can view your performance and cheer you on! Designed from scratch by former F1 driver Jonathan Palmer. Freedom newbie Katie Harbon (from NHRR) showed everyone how it was done in the standard event (10km run/39km bike/5km run) with an outstanding first place time of 2:11:09! Other Freedomites took on the speedier sprint event (5km run/20km bike/2.5km). First for the club Mickey Day came 58th in 1:02:00 followed by Lee Gilchrist 117th in 1:06:37 with GB athlete Richard Pitcairn completing the event 189th in 1:25:02. Weekend warriors Ann Tryssesoone and Emma Croxon took on the Gt. Eastern Half in Peterborough. This fast and flat course is guaranteed a PB and formed part of Emma's training for the Dublin Marathon coming up at the end of the month. Emma was delighted with a time of 2:56:39 whilst Ann who was acting as pacer for another athlete sped ahead in 1:58:56. Meanwhile over at the Royal Parks Foundation Half at Hyde Park the race was celebrating its 10th anniversary. There to blow up the balloons was Monica Corcoran who battled through the crowds to post an impressive time of 1:57:25. Barcelona, the cosmopolitan capital of Spain’s Catalonia region, is famed for its art, architecture and also it’s Ironman 140.6km race. Five Freedom matadors took on what is undoubtedly the longest day in sport. A day punctuated by sweat, tears and flat Coke. We salute Simon Jackson in his first time going long in placing an incredible 143rd in 9 hours 36 minutes and 3 seconds, also Chris Clark 899th 11:02:19, club chairman Kevin Smart 1008th in 11:13:33, Rob Sedgwick who tops off a truly amazing season 1239th in 11:35:21 and Dean Heuer 1711th in 12:26:25. We raise a chilled cerveza in respect guys on a job well done. Over in a rather soggy Letchworth the mercury wasn’t peaking quite so high at the 30th running of NHRR's Standalone 10K. Spirits were lifted though, mainly due the giddy aroma of Deep Heat and bacon rolls. In a failed attempt to confuse the race organisers there was much swapping of race numbers on the day, but thanks to Rob Evan’s telephoto lense the culprits were named and shamed. In no particular order, the weary 6.2 miler’s results were as follows: Rob Clarke 52:47, Andrew Fenton 54:07, Mark Lacy 48:59, James Parsons 37:44, Paul Fairchild 43:34, Declan McCabe 44:14, Jenny Cotter 46:57, Bettina West 49:00, Lee Gilchrist 43:38, Matt Wainwright 52:46, Richard Springall 40:26, Gareth Sharp 57:32, Sam Sharp 1:17:25, Sarah Taylor 57:19, Emma Croxon 1:17:26, Liz Aitken 1:02:39, James Thomas 43:31, Gareth Charles 40:39, Gareth Bates 43:04, Lee Hayes 41:36, Mark Bullivant 1:01:44, Adrian Robinson 47:52, Jane Britten 59:22, Ann Tryssesoone 50:37, Mikey Day 57:03, Helen Cairns 45:34, Greg Cairns 45:03, Tracey Palmieri 42:41 and Rachel Carling 44:32. There to dish out the prizes at the end was Freedom's very own Jane Britten who holds the accolade of being Standalone's first ever female winner! 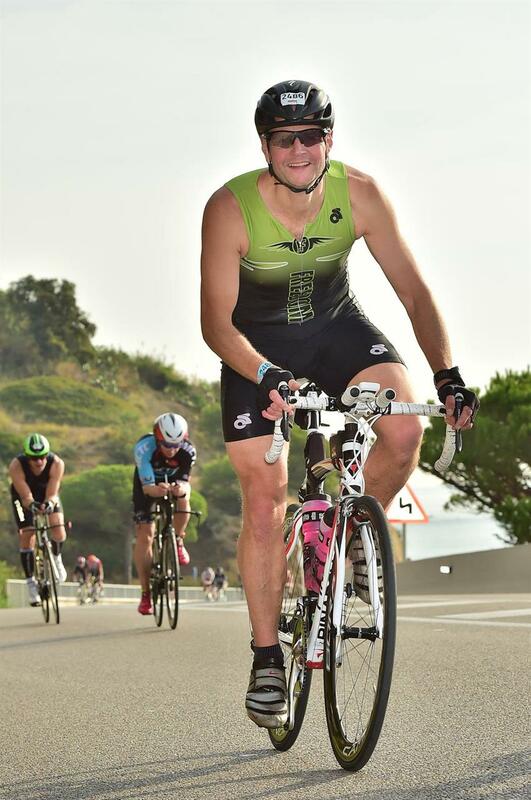 Kevin Smart at Ironman Barcelona. Last weekend Ann Tryssesoone took on the L’Etape London organised by Human Race in conjunction with Le Tour de France. The 117 mile (188km) countryside looped course took riders out from Stratford to Saffron Walden via Chelmsford. Despite having to refuel with copious amounts of cake enroute, Ann was delighted to place 855th in a time of 8:06:53. Richard Pitcairn headed over to Rotterdam for the ITU World Olympic Triathlon Championships series final. Hampered by ongoing foot problems, having to negotiate two transition areas and tackling an awkward bike course; Richard still managed to place an excellent 21st in his (70-74) Cat. in a very respectable time of 3:04:21. Richard Springall completed the Rutland Water Vitruvian Triathlon, 1.9km Swim 85Km Bike and 21km Run in a time of 4hrs 53 mins. Other middle distancers were at the Weymouth 70.3 Half Ironman race enduring a choppy sea swim and very cold bike segment. Mickey Day was first home for Freedom in 5:36, followed by Suzy Hawkins 5:44, Rob Sedgwick 6:06 and Rachel Kelly on her first attempt at the distance in 6:32. Rachel was racing in memory of a special friend and managed to raise over £2,500 for the Beating Bowel Cancer charity. Over at Eton Dorney nr. Windsor, Adrian Robinson raced the Duchenne UK Olympic Triathlon in aid of Muscular Dystrophy. He was very pleased in achieving his target time of 2:57:04. Thomas Sauka raced one of the toughest triathlons in the UK - The Helvellyn. The race incorporated a 1mile lake swim, 38 mile bike followed by a gruelling 9 mile fell run up to the top of Kirkstone Pass. Thomas completed in 4:28:09.